Visitors staying in Chicago and looking to plan a day trip or two will find a number of tempting attractions just outside of the city. The Morton Arboretum is especially nearby and those with a rental car can comfortably drive here in around 45 minutes. 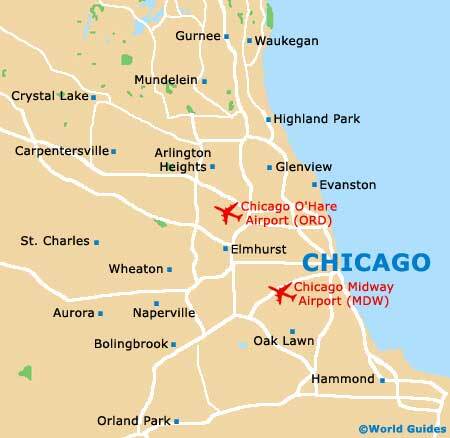 If you are on holiday with children, then be sure to pencil in a trip to see the animal attractions of nearby Brookfield Zoo, which lies some 14 miles / 23 km to the west of downtown Chicago, just past Berwyn. Brookfield hit the news headlines around the world in 1996 when a boy fell into the Western lowland gorilla enclosure and one of the female gorillas carefully picked him up, cradled him in her arms and then gently took him to her keepers. Another popular choice and standing near O'Hare Airport, the Allstate Arena regularly draws enormous crowds and is the home ground of the city's DePaul Blue Demons basketball team. The wonderful gardens of Morton Arboretum are located nearby Chicago, in the neighboring town of Lisle. With almost 2,000 acres / 800 hectares of landscaped gardens, mature trees and shrubs, other attractions at the arboretum include footpaths, a library, a gift shop, a restaurant, a café and over 40,000 plants, covering more than 3,000 different species. The gardens were originally created in 1922 and are situated 25 miles / 40 km to the west of the city. Situated within the Kenwood area and on the southern side of Chicago, the Bob-O-Link Meadow is a peaceful wildlife haven in Jackson Park. 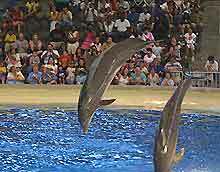 Attractions here include nature tours, wild plants and flowers, together with many large trees. The Bob-O-Link is the perfect place to come when you want to escape from busy city life. One of the most popular tourist attractions for children and families based in Chicago, Brookfield Zoo is situated in the westerly suburbs of the city, being just over 20 minutes away by car or bus. Covering over 200 acres / 81 hectares, Brookfield Zoo was actually one of the first in the world to exhibit animals in natural surroundings, rather than in artificial cages. These zoological gardens were founded in 1934 and come with a large number of attractions, including Tropic World - with monkeys, waterfalls and a raised catwalk, Baboon Island, the Reptile House, walruses, lions, tigers and dolphin shows. There is also a children's petting zoo with many friendly animals. Children are allowed to stroke many of these creatures, as well as paint pictures of them whilst learning interesting information about their care. Seasonal events add further interest, while parking is available onsite. Situated close to the northwesterly O'Hare district and formerly named the Rosemont Horizon, the Allstate Arena is a large and popular multi-purpose arena, with almost 20,000 seats. The Allstate holds many indoor events each year and these include large markets, live music - such as the Boston Pops, sporting events and family entertainment. Car parking is conveniently available close by.